I'll be heading down to Lake Waccamaw this Saturday for the revived version of the Gator Trail 50K. The race was held for 4 years between 2001 and 2004 but has been off the schedule since then. It was a race I wanted to run but never fit into my plans and then it was gone. I was happy to see that it was being revived and made a spot for it in my schedule this year. I only regret that I will be unable to attend the Ellerbe Springs Marathon since they are held on the same day now. The race is directed by Grant Egley , who lives beside the lake and is supported by the Wilmington Roadrunners. My friend Laura had run each of the previous years with a lot of success and some fast times. She won in 2003 and tied for the win in 2002 with Crystal Moore. Crystal won the first one in 2001 and Buddy Nash won the overall that year. If any one has info on the 2004 event please let me know. I am hoping to have a good run and plan to shoot for a 50K Pr if the trail conditions are good. There are actually alligators that live in the area around the lake which abuts the Green Swamp Area. There are also black bear in the woods there among other wildlife. 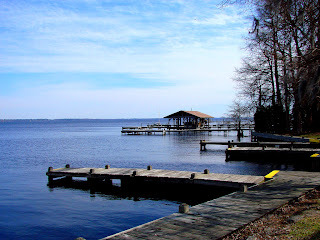 The lake itself is one of the many Carolina Bays unique to the area of southeastern NC and northeastern SC.